Is your pool becoming an eye sore? Whether your backyard swimming pool is extensively damaged or no longer used, you may be considering pool demolition. 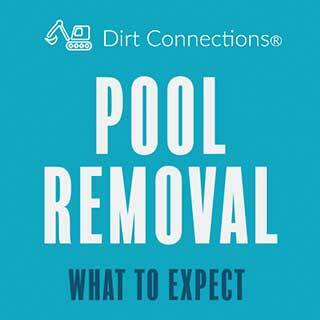 Dirt Connections offers professional inground pool removal services for homeowners who want to safely and efficiently remove their old or unwanted swimming pools. 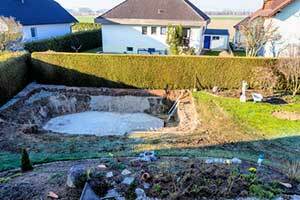 Once demolished, our crew of pool demolition contractors will haul away the mess and fill the hole with dirt. Learn more about pool removal and what you can expect during the process. Each year, thousands of homeowners make the decision to get rid of their swimming pool. At Dirt Connections, we aim to make this process as fast and simple as possible. For homeowners on a budget who want to remove their pool as quickly as possible, partial swimming pool removal is a viable option. Not only is partial pool removal the most affordable choice, it is also the most commonly used method among pool removal contractors. However, your choice between a partial removal and full removal will be based on the specific guidelines in your area and the potential future uses of the land. If you choose a partial swimming pool removal, your pool will be completely drained of water. Next, 3-inch deep holes are drilled into the bottom of the pool to demolish the top layer. These holes ensure that the pool drains properly in the future as moisture from rainwater and other sources collect. The sides of the pool are broken down next, but as this is a partial pool demolition, only about 18-inches from the top is demolished. The rubble from the top is placed at the bottom of the pool. 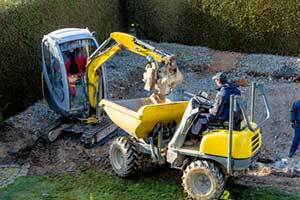 The swimming pool is then backfilled and compacted. In total, partial pool removal takes an average of 2 to 5 days. Of course, there are some downsides associated with partial pool removal. If you go to sell your home, some buyers may find the absence of a pool to be a perk. However, partial swimming pool removal could affect the value of your home and must be disclosed to all future buyers. Most areas consider the area where the former pool used to be unbuildable after a partial removal. This means that you cannot add dwellings or additions to the land. However, sheds, trees, and other landscaping are usually safe. While more costly than a partial pool removal, most pool demolition contractors agree that full swimming pool removal is a better option. Depending on what type of inground pool you own, full removal may be necessary. Inground pools with steel walls or a steel collar require the steel to be removed first. This alone makes a full pool demolition necessary. If you are not sure if your pool is better suited for a partial or full removal, contact our pool removal contractors for assistance.